Jack Pine Cycle is proud to present this extremely rare 1957 T100RS factory race machine in partnership with expert renown restorer Bob Buchanan. This machine is very highly regarded amongst collectors, and won “Best in Show” at the prestigious 2016 Triumph National Rally. As a customer order came in for either T100RR flat tracker or T100RS road racer, these engines were installed in either rigid or swing arm frames with the appropriate exhaust, wheels, brakes, fenders, oil tanks, fuel tanks, transmissions, and seats. 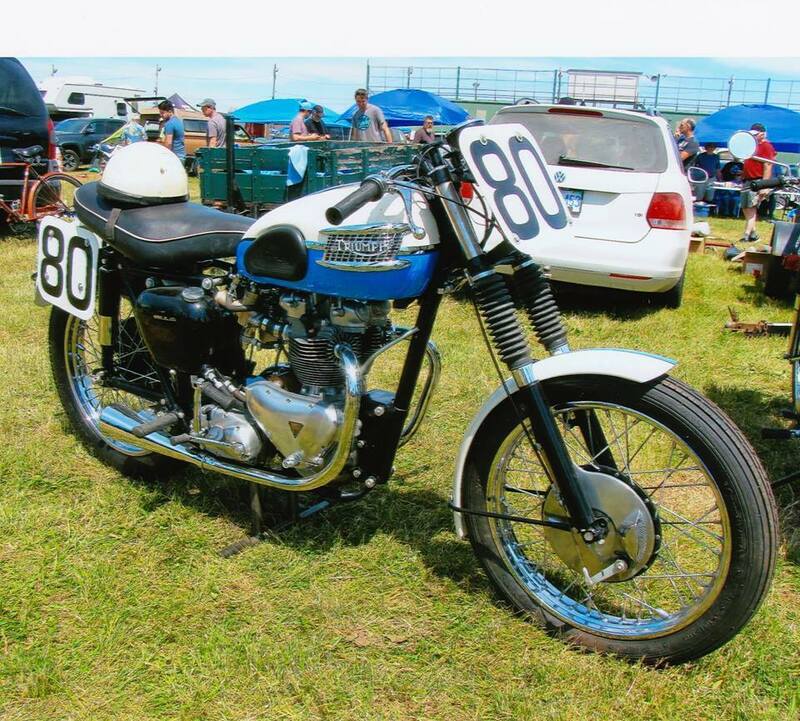 Triumph built a total 78 flat trackers and 66 road racers which were advertised for sale up to the 1959 model year. Thus, this machine is amongst the rarest and most desirable Triumph motorcycles ever produced. This particular bike, 04645 was ordered in Dec 1956 by Colquhoun Motorcycle in Halifax Nova Scotia (three of the five sent to Canada were road racers). It was built on January 17th and sent out February 1st of 1957. The bike arrived in April, and quickly sold to Mike Chu of the Canadian Navy who rode it on the road and raced in the first road races in Atlantic Canada at Scoudouc airport in New Brunswick. – Proper 1 gallon oil tank, as well as the large fuel tank with rear facing taps. – Brand new rims, spokes, QD rear hub and sprocket, alloy fenders, fork tubes and springs, tires, tubes, chains, seat cover, clutch plates, dual instrument bracket, brake shoes. – Frame, hubs and all other black parts are powder coated. Mr Buchanan fabricated and/or modified the front & rear fender stays, number plate holder, folding rear sets, brake pedal, mounting plates, modified new exhaust pipes and megaphones. This motorcycle is located in Stratford, Ontario, Canada, and will be sold with a Bill of Sale only. Please note that the center stand shown in the photos is not included – a jack stand will be provided instead.